Today Harper started her second and final year of preschool. Next stop: Kindergarten. I'm not ready to let my baby go. Once they start school, the years just fly by. Right before your very eyes, which, by the way, mine are starting to tear up right now. I am the youngest of four girls, and I will never forget my mother introducing me to people as "my baby". I would always say to her, "I'm not a baby! I'm 10. How can I be a baby?" Only now, do I truly appreciate how my mother was endearingly referring to me as her baby. Here's my baby on her first day of school. It was hard to stop hugging her this morning. There were no tears (from either of us) at the drop-off. She walked right into her classroom and sat down. I was proud of her. She wasn't clinging to my leg, looking up at me with pouty, puppy dog eyes. It is our job as parents to prepare our children for a life independent of us. I get that. But until that time comes, I will savor every moment that she relies on me, kisses me, hugs me, says she loves me, and yes, clings to my leg and looks up at me with pouty puppy dog eyes. 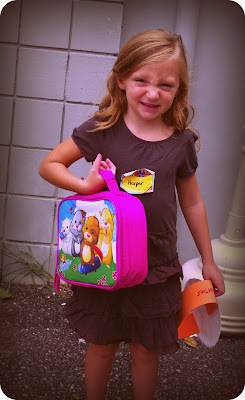 I loved the first day of school so much - just reading about it makes me feel all nostalgic! Also, it was great meeting you this weekend!